I am not sure if I call this a re-post but this is the second time I will be doing a salmon and sushi roll but this time there is an extra salmon wrapped together with the nori sheets, I got this idea lately at one of our favourite Japanese restaurant here in Auckland called Narita. Although, I have first seen this style in one of the sushi shops in Nice. Like before we were craving again for some Japanese and ordered one big bento box for each us and a dozen sushi, the sushi was a bit different from what we ordered before as it was half wrapped with salmon over the nori sheets. I love this sushi variant but I am not sure how is it called is it just called Salmon and Avocado roll, or does it have a special name? Place rice in ceramic bowl then slowly add vinegar while mixing the rice. Set aside to cool in room temperature but keep rice covered with a damp cloth while preparing. Place a bamboo sushi mat on a flat surface then place a sheet of cling wrap on top. Place thinly sliced salmon on top of the cling wrap then place nori on top of salmon; make sure salmon is placed aligned on the lower bottom of the nori sheets. Cover upper half portion of nori with thin layer of sushi rice, press it firmly with a bamboo spoon and distribute it evenly on the edges. 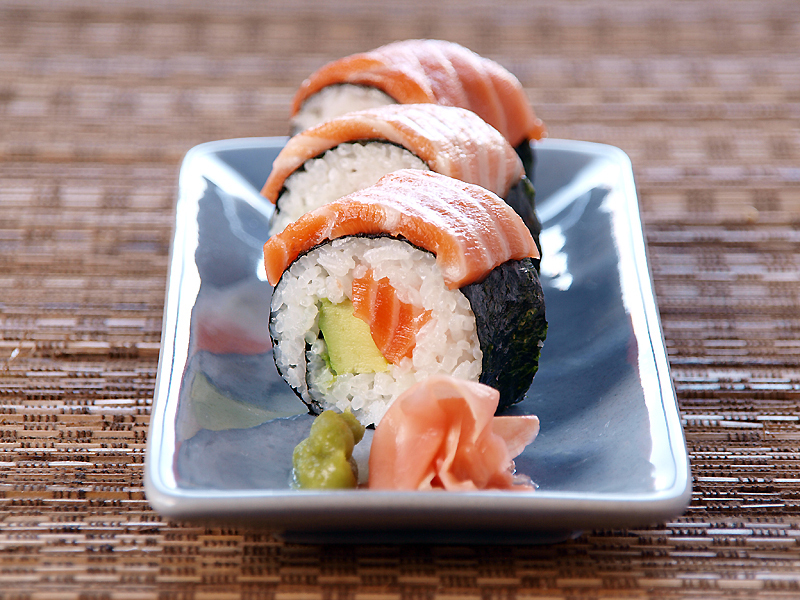 Place a pinch of wasabi paste across the top edge the place strips of avocado and salmon side by side. Remove the roll from the bamboo mat and carefully slice into 1 inch thick pieces, remove the cling wrap. Moisten the sharp knife every time you cut a new slice. Perfection! I could enjoy this morning, noon and night! Beautiful salmon & avocado roll! It is my first time too to see this, but I’d love extra salmon slice anyway. 😉 You roll so perfectly. My son and I are crazy about salmon and we can finish like 5 rolls together. Funny but I just posted something about sushi today.I’m no pro on sushi but my husband just loves Japanese food! Perfect and healthy Raymund, both salmon and avocado are my fav buts its like once a while for us, you know the price can be a killer at times. They look super cute! Great idea the extra slice of salmon! This looks awesome. Katherine and I had sushi Friday night and I’m still on a high. I am not a huge sushi fan but this Salmon and Avocado Sushi recipe is amazing. I love the colors and how tasty and inviting it looks. The basement one is called Tanuki’s Cave in CBD (If were referring to the same thing), I love their yakitori. Unbelievably beautiful. Or I *would* say that, but I’ve seen what you can do, Raymund! How about: Mouthwatering. Spectacular. I think this is sort of like combining a sushi roll with nigiri-sushi. But whatever it is, it’s irresistible. Sushi rolls are one the those things I think I could eat every day. These look light and great. Absolutely gorgeous! Seriously, this roll looks more appetizing than the sushi I ordered at a restaurant last week. You never cease to amaze me, Raymund! Gorgeous photo! I love sushi. It looks so difficult to make, but yours looks flawless! Very professional-looking rolls, Raymund. Very nicely done. This is the most gorgeous sushi rolls Raymund! You are so talented. This roll is making my mouth water! that green and peach bits in front of salmon, what’s that?? i can already imagine the taste and the texture. lovely! must try to make this too! A really beautiful presentation, looks yumm…. But if I could make an adjustment to the ingredient, mirin is rice wine (alcoholic) and is a totally different ingredient to rice wine vinegar. What is used for sushi is rice wine vinegar, and not mirin.